This is a side-by-side view of large cyclones at the north (left) and south (right) poles of Saturn taken in June 2008 by the visual and infrared mapping spectrometer onboard the Cassini spacecraft. Scientists have discovered a giant cyclone swirling onSaturn?s north pole, and observed a similar storm on the planet?s south pole indetail 10 times greater than before, thanks to new images from NASA's Cassinispacecraft. The new images, taken in infrared light, reveal for thefirst time a massive cyclone churning at the north pole, similar to a gigantic storm onSaturn's south pole. "These are truly massive cyclones, hundreds of timesstronger than the most giant hurricanes on Earth," said Kevin Baines, Cassini scientist on the visual andinfrared mapping spectrometer at NASA's Jet Propulsion Laboratory in Pasadena,Calif. "Dozens of puffy, convectively formed cumulus clouds swirl aroundboth poles, betraying the presence of giant thunderstorms lurking beneath.Thunderstorms are the likely engine for these giant weather systems." Researchers think the storms are powered by heat releasedfrom condensing water in thunderstorms deep down in the atmosphere, similar to the way condensing water in clouds on Earthpowers hurricane vortices. But unlike Earth's hurricanes, which stem from the ocean?sheat and water, Saturn'scyclones have no body of water at their bases. The storms on that planetare locked to Saturn's poles, whereas terrestrial hurricanes drift across theocean. 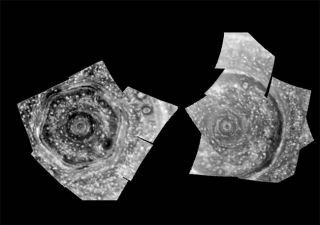 Cassini mapped the entire north pole of Saturn in detail ininfrared, with features as small as 120 kilometers (75 miles) visible in theimages. Time-lapse movies of the clouds circling the north pole show thewhirlpool-like cyclone there is rotating at 325 mph (530 kph) ? more than twiceas fast as the highest winds measured in cyclones on Earth. Surrounding the cyclone is an odd, honeycomb-shaped hexagon,which itself does not seem to move while the clouds within it whip around athigh speeds. Strangely, neither the fast-moving clouds inside the hexagon nor thecyclone seem to disrupt the six-sided feature. The cyclone on Saturn's south pole has been observedbefore, but never in as much detail. Earlier images revealed an outer ringof high clouds surrounding a region previously thought to be mostly clear airinterspersed with a few puffy clouds circulating around the center. The newimages show that the clouds are actually vigorous convective storms that formyet another distinct, inner ring. ?What looked like puffy clouds in lower resolution images are turning out to bedeep convective structures seen through the atmospheric haze,? said Cassiniimaging team member Tony DelGenio of NASA?s Goddard Institute for Space Studiesin New York. ?One of them has punched through to a higher altitude and createdits own little vortex.? The outer ring of high clouds around the vortex is 2,500miles (4,000 kilometers) wide, and its clouds cast shadows, indicating they are25 to 45 miles (40 to 70 km) above the clouds inside the ring. The new imageshint at an inner ring about half the diameter of the main ring, and so the actualclear "eye" region is smaller than it appeared in earlierlow-resolution images. ?It?s like seeing into the eye of a hurricane,? said Andrew Ingersoll, a memberof Cassini's imaging team at the Caltech in Pasadena. The Cassini-Huygens mission, which has been in orbit aroundSaturn since July 2004, is a collaboration between NASA, the European SpaceAgency and the Italian Space Agency.